Two centuries ago there was an allegory doing the rounds of England. 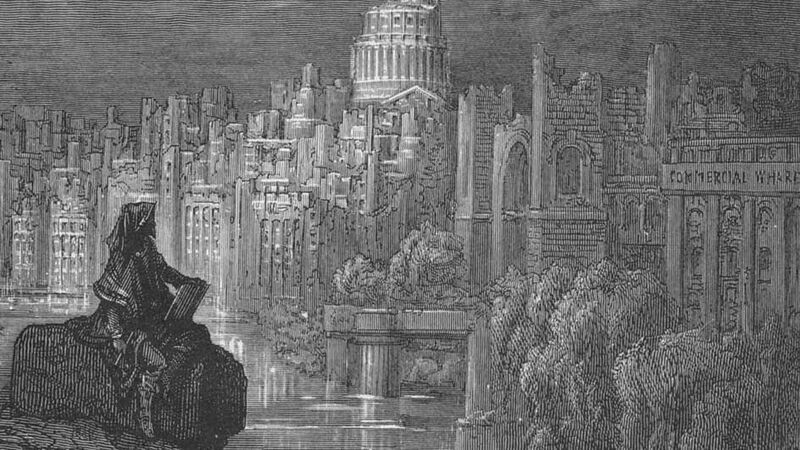 A “New Zealander” – meaning a Māori – at some latter date sat drawing the ruins of London. A sign that all great cities and civilisations eventually diminish and others take their place. That hasn’t happened yet, although England’s power and influence are greatly diminished. And many today wouldn’t see, or perhaps want, New Zealand taking up the mantle of a great, or even middling, power. What is within our means is to be a great country. As the responses to the terrorist attack shows, there is much to be thankful for and proud of in New Zealand and its people. But we’ll need more than thankfulness and pride. It’s easy to focus on what’s not so great – inequality, racism, poor mental health, declining environmental qualities, low wages and productivity. But in this post I will focus on what else we are doing relatively well. These help provide a foundation to grow from. Often visions of the future are boiled down to pessimistic or optimistic scenarios. A possibilist approach requires navigating threats and opportunities, optimism and pessimism. It also requires taking account of history so that you can go from possible to plausible (ie, more likely) futures. New Zealand ranks well in a range of international comparisons. You can disagree with the methodologies, but a general picture emerges that there is a lot going for our country. Though it may not feel like it at the moment, we are one of the “happiest” countries in the world according to the World Happiness report. This is based on six factors – freedom, generosity, healthy life expectancy, income, social support and trust. We also compare well on a range of other “better life” indicators. We are an easy place to do business, and have low levels of corruption. Though our productivity isn’t great despite good policy settings. 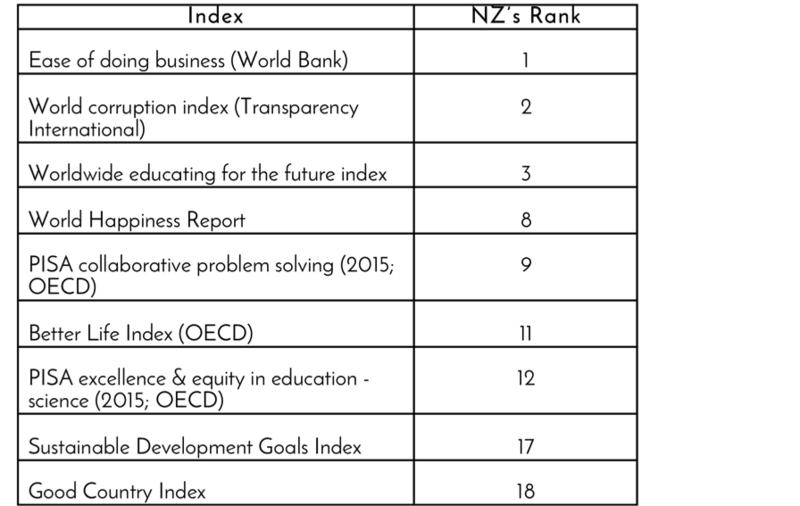 Internationally our education system has rated well, particularly when looking at readiness to deliver future-oriented skills and collaborative problem solving. We are also one of the most advanced digital government nations. In addition, the growing interest in Māori culture and language, and consecutive governments (and society’s) willingness to address some of the past wrongs against Māori are welcome advances, even if there is still much to do. Including making the study of our colonial history compulsory in schools. A strong sense of cultural identity is an important factor in the success of Māori businesses. As is Kaitiakitanga (guardianship). Our slow but growing confidence in biculturalism can have unforeseen benefits that can help address some of the challenging problems we and the rest of the world are facing. Such as developing skills to address international climate change disputes. Socially and culturally we have a lot going for us. Of course there are many things that we aren’t doing so well on. My point isn’t that we should be complacent, or oblivious to what’s not good. Rather it is that we are doing some things well (or at least better than many other places) that help create the possibilities to do better. Futurists and strategists often talk about the future being volatile, uncertain, complex, and ambiguous. Responses to meet those challenges can involve having a vision of where you want to get to, understanding the nature of the issue and your capabilities, courage to be bold, and adaptability, being flexible but still working toward the vision. As we have also seen this past week, values are also an essential component that influence the nature and direction of change. Julie Fry and Hayden Glass have written a book – Ambition. What New Zealanders think and why it matters – that notes that we aren’t ambition-less, but that the goals we set may often be too small. Now seems a good time to re-look at the goals that we do set ourselves, both individually and as a society. As well as to develop the vision, understanding, courage and adaptability we will need. As the Prime Minister, and much of New Zealand, has demonstrated in the past week, what we say and do can inspire and influence the rest of the world. A descendant may never sit and sketch the ruins of London, but we are more than capable of becoming a great and influential nation.